Nostalgia Electrics Circus Animal Waffle Maker Just $9.99 Down From $14.99 At Best Buy! 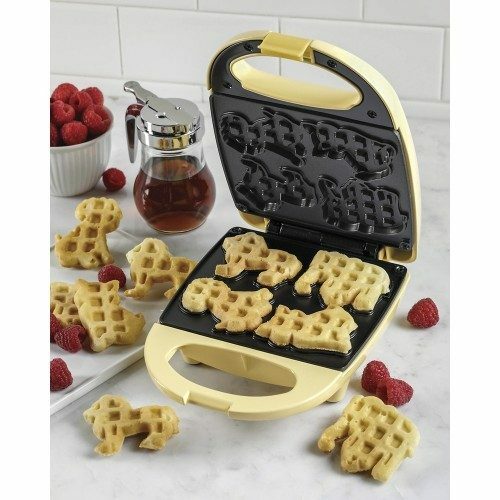 You are here: Home / Great Deals / Nostalgia Electrics Circus Animal Waffle Maker Just $9.99 Down From $14.99 At Best Buy! Best Buy has this fun Nostalgia Electrics Circus Animal Waffle Maker on sale for $9.99 (Reg. $14.99) + FREE in-store pick up! Nostalgia Electrics Circus Animal Waffle Maker: Make delicious, animal-shaped waffles with this waffle maker, which makes a dog, a cat, an elephant and a lion in every batch. The nonstick, die-cast aluminum material provides easy cleanup and even heat distribution, and the latch locks for security during baking.